About 1 in 3 adults in the U.S. has high blood pressure, but many don’t realize it. High blood pressure is sometimes called a “silent killer,” because it usually has no warning signs, yet it can lead to life-threatening conditions like heart attack or stroke. The good news is that high blood pressure, or hypertension, can often be prevented or treated. Early diagnosis and simple, healthy changes can keep high blood pressure from seriously damaging your health. Normal blood flow delivers nutrients and oxygen to all parts of your body, including important organs like your heart, brain, and kidneys. Your beating heart helps to push blood through your vast network of blood vessels, both large and small. Your blood vessels, in turn, constantly adjust. They become narrower or wider to maintain your blood pressure and keep blood flowing at a healthy rate. It’s normal for your blood pressure to go up and down throughout each day. Blood pressure is affected by time of day, exercise, the foods you eat, stress, and other factors. Problems can arise, though, if your blood pressure stays too high for too long. High blood pressure can make your heart work too hard and lose strength. The high force of blood flow can damage your blood vessels, making them weak, stiff, or narrower. Over time, hypertension can harm several important organs, including your heart, kidneys, brain, and eyes. Anyone, even children, can develop high blood pressure. But the risk for hypertension rises with age. “Once people are in their 60s, about two-thirds of the population is affected by hypertension,” Whelton says. Excess weight or having a family history of high blood pressure also raises your risk for hypertension. African Americans are especially likely to get hypertension. Compared to Caucasian or Hispanic American adults, African Americans tend to develop hypertension at a younger age and to have a higher blood pressure on average. Because it usually has no symptoms, the only way to know for sure that you have hypertension is to have a blood pressure test. This easy, painless test involves placing an inflated cuff with a pressure gauge around your upper arm to squeeze the blood vessels. A health care provider may then use a stethoscope to listen to your pulse as air is released from the cuff, or an automatic device may measure the pressure. Blood pressure is given as 2 numbers. The first number represents the pressure in your blood vessels as the heart beats (called systolic pressure). The second is the pressure as your heart relaxes and fills with blood (diastolic pressure). Experts generally agree that the safest blood pressure—or “normal” blood pressure—is 120/80 or lower, meaning systolic blood pressure is 120 or less and diastolic pressure is 80 or less. “Hypertension is defined as having an average blood pressure of above 140/90,” says NIH’s Dr. Lawrence Fine, who oversees research on the treatment and prevention of hypertension. Since blood pressure can vary widely from day to day, a diagnosis of hypertension is usually based on an average of 2 or more readings taken on 2 or more occasions. If your blood pressure falls between “normal” and “hypertension,” it’s sometimes called prehypertension. People with prehypertension are more likely to end up with high blood pressure if they don’t take steps to prevent it. If you’re diagnosed with high blood pressure, your doctor will prescribe a treatment plan. You’ll likely be advised to make healthy lifestyle changes (see the Wise Choices box). You may also need to take medications. 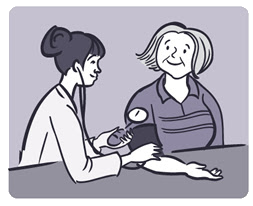 The goal of treatment is to reduce your blood pressure enough to avoid more serious problems. How low should you aim when reducing your blood pressure? The answer depends on many factors, which is why it’s important to work with your doctor on blood pressure goals. Most current guidelines recommend aiming for a systolic pressure below 140. These medical guidelines are sometimes adjusted as new research is reported. A large NIH-funded study recently found there may be benefits to aiming for a much lower systolic pressure—120 or less, instead of 140—at least for some people. The study looked at adults ages 50 and up who had increased risk for cardiovascular disease but didn’t have diabetes. Half aimed for a systolic pressure of 120. The rest aimed for a pressure of 140. The study was stopped early, after about 3 years, when clear benefits were seen in the lower blood pressure group. “When treating to the lower goal of 120, the risk of having a cardiovascular complication such as a heart attack or stroke was reduced by 25%, and the risk of death from all causes was reduced by 27%,” Fine says. This lower-goal group, though, tended to need 1 additional blood pressure medication; they also had more hospitalizations for side effects, including low blood pressure, fainting, and possible kidney damage. DASH stands for Dietary Approaches to Stop Hypertension. “It’s not a diet to go on for a short period of time, but one that’s meant to be part of a healthy lifestyle and enjoyed for life,” McMurry says. The DASH eating plan requires no special foods. Instead, it provides daily and weekly nutritional goals. It’s high in vegetables, fruit, whole grains, and low-fat dairy foods but low in saturated fat and added sugar. “DASH is beneficial even for people who have normal blood pressure or who have prehypertension. It can help keep blood pressure from progressing to higher levels,” McMurry says. Learn more about DASH atwww.nhlbi.nih.gov/health/health-topics/topics/dash.